Increased performance from a modern engine can be achieved in a few simple steps, one of which is to improve the breathing. High flow performance exhausts in effect get the exhaust gases out of the way as quickly as possible, which in turn helps the engine spin faster and produce more power. For optimum performance this will ideally be combined with an air induction kit or free flow replacement panel filter. Full System - this is the term given for a system that is supplied from the downpipe or catalytic converter (cat) to the back of the car. It can have one or two silencers in the system depending on the car. Backbox - this is simply the rear silencer that replaces the original and includes the rear tailpipe. Sometimes referred to as a Rear-Can or Muffler. A range of different tailpipe sizes and styles are available for all makes and models, so you can make an individual mark on your vehicle. The work involved in fitting a Full System is often less than a Backbox as it is usually a straight replacement yet a Backbox can require the original system to be modified. For this reason it can be more economic and indeed will be more beneficial to fit a Full System where available. Most exhausts are now manufactured using top quality Stainless Steel that is guaranteed for the life of the ownership of the vehicle. Mild Steel versions are available from some manufacturers for a more economic alternative. Different brands offer different benefits. These range from a mellow sound through to a more sporty sound and different tailpipe designs. Manifolds - stainless 4-branch manifolds are available for certain vehicles. Further performance gains can be made, plus the engine bay looks incredible! Sports Cats & De-Cats - we can supply performance catalytic converters that remove the naughty harmful gasses but increase the through-flow thus boosting performance. Cat replacement pipes (De-Cats) obviously get rid of the performance sapping catalytic converter but will not be accepted at MOT stations. Let us guide you through the options and match them to your requirements. 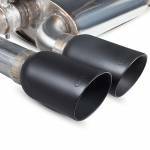 Carnoisseur have a full range of Scorpion Exhausts. To view the Scorpion Exhausts we offer simply make your selection below. You can purchase Scorpion Exhausts on-line or through our network of Carnoisseur Outlets. To find out more about Exhausts click here to view our Carnoisseur Exhausts Guide.